Today I am going to tell you about IBPS Specialist Officer Eligibility criteria. Every year IBPS conducts 4 major recruitment. These recruitment are for the posts of Probationary Officer, Clerk, Officer & Assistants in RRB and Specialist Officer. The eligibility criteria for Specialist Officer Posts are always quite confusing. While in Probationary Officer and Clerk the eligibility required is graduation however in Specialist Officer Recruitment there is different type of qualifications required. Let us now discuss all the important eligibility criteria which are required for IBPS Specialist Officers posts. The article is in question answer format which will address your specific queries. Question: Which are the participating banks in IBPS Specialist Officer Recruitment? Answer: 20 banks participate in the recruitment process. This includes 19 nationalized banks and IDBI Bank. SBI does not participate in this recruitment as SBI is having its own recruitment process. Question: I am a fresher can I apply for these posts? Answer: Fresher are eligible provided you are having the required qualifications. Question: I am in the final year/final semester of my degree. Am I eligible? Answer: Final year/ semester students are not eligible for IBPS Specialist Officer Recruitment. Question: What are the posts normally announced through IBPS Specialist Officer Recruitment? Answer: The posts normally announced through IBPS Specialist Officer Recruitment are of Specialist Officers in various cadres like IT, Agriculture, Rajbhasha, Law, Human Resources, Marketing, and Finance in various public sector banks. 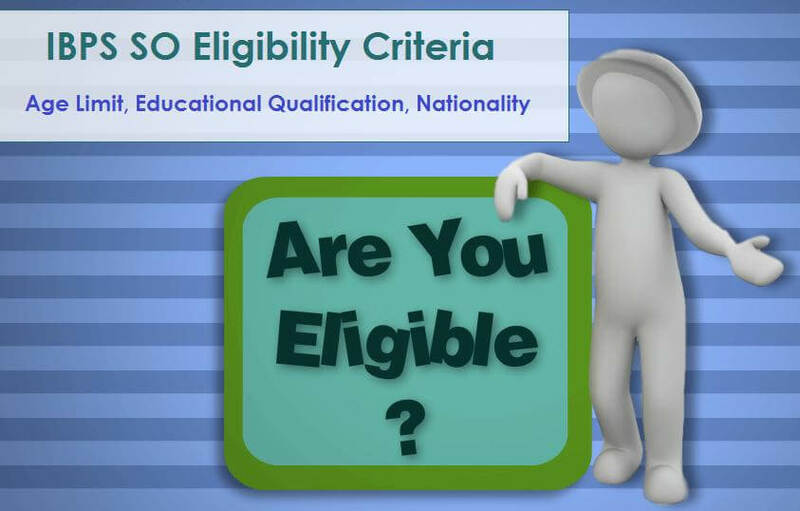 Question: What are the eligibility criteria for IBPS Specialist Officer Recruitment regarding citizenship/nationality of the candidate? (v) A person of Indian origin who has migrated from Pakistan, Burma, Sri Lanka, East African countries of Kenya, Uganda, the United Republic of Tanzania (formerly Tanganyika and Zanzibar), Zambia, Malawi, Zaire, Ethiopia and Vietnam with the intention of permanently settling in India, provided that a candidate belonging to categories (ii), (iii), (iv) & (v) above shall be a person in whose favor a certificate of eligibility has been issued by the Government of India. Question: What are the eligibility criteria for IBPS Specialist Officer Recruitment regarding age of the candidate? 5 years for Scheduled Caste/ Scheduled Tribe . 3 years for Other Backward Classes. 5 years for Ex-Servicemen, Commissioned Officers including Emergency Commissioned Officers (ECOs)/ Short Service Commissioned Officers (SSCOs) who have rendered at least 5 years military service and have been released on completion of assignment (including those whose assignment is due to be completed within one year from the last date of receipt of application) otherwise than by way of dismissal or discharge on account of misconduct or inefficiency or physical disability attributable to military service or invalidment. 5 years for persons ordinarily domiciled in the Kashmir Division of the State of Jammu & Kashmir during the period 01.01.1980 to 31.12.1989 . 5 years for Persons affected by 1984 riots. Question: What are the eligibility criteria for IBPS Specialist Officer Recruitment regarding Educational Qualification of the candidate? Graduate and Full time Post Graduate degree or Full time Post Graduate diploma in Personnel Management / Industrial Relations/ HR/ HRD/ Social Work/ Labor Law. Graduate and full time MMS (Marketing)/ MBA (Marketing)/ Full time 2 years PGDBA/ PGDBM/ PGPM/ PGDM with specialization in Marketing. Disclaimer: These are the eligibility criteria for IBPS Specialist Officer Recruitment. However before applying please check the official notification published by the IBPS.